Crouched down out of sight on the far side? Is it just me, or does "The Past" feel like a letdown compared to this? It's such a simple strip, it almost feels blah. I could see that. Although the link I most miss from the main page is thisisindexed This is Indexed[/url]. 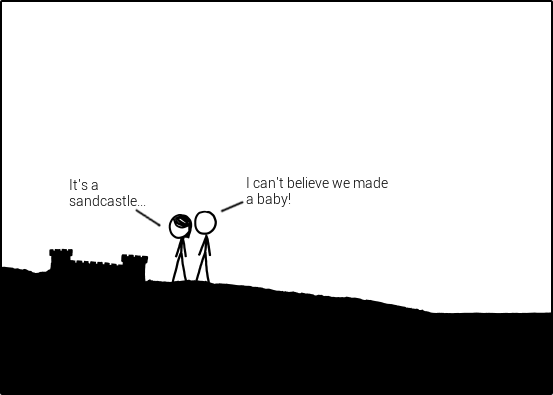 Its the only other webcomic I read and I learned about it from xkcd yet Randall dropped it from the site some months ago. There's no-one there at all now. I'm just staring at the beautiful sandcastle. It feels so different after watching the activity for so long. I don't know what's going to happen next. Way back on the first day he actually stood up while I was watching. I was ecstatic. Then about a minute later he was all the way down the hill (I didn't know it was a beach then). I hadn't refreshed my screen. Must have been latency. I almost registered at that point because no-one else had reported the standing up scene. However I finally had to register now to say how much I really love this comic. I've been lurking for years, checking in three times a week, and was lucky this time to catch the first or maybe second scene, so was in from the beginning. I've followed all but five pages of this thread; very enjoyable. Along with many other great jokes. but i dont want to spam them all. Last edited by Coal on Wed Mar 27, 2013 7:03 am UTC, edited 1 time in total. Last edited by eidako on Wed Mar 27, 2013 7:26 am UTC, edited 2 times in total. did he just slip, or did he do it intentionally? ugmhemhe wrote: did he just slip, or did he do it intentionally? I woke up to find the panel with the completed sand castle and no people and was genuinely sad that it was over. Then 20mins later there's an update and I'm smiling like a maniac that its still going. She's gonna be so pissed when she comes back and he's turned it into a giant phallus. As would a movie starring Bill Murray. Not to mention some people who hold that it's more like a big ball of wibbly wobbly . . . timey wimey . . . stuff. I think he slipped while trying to sneak out of the frame. Who would he have been hiding from if not us? The comic strip is tantalizing us with its slow reveal. We are experiencing a strip tease. But if he's going to start destroying it now, then the whole "it gets destroyed and does an infinite loop" theory might stand. 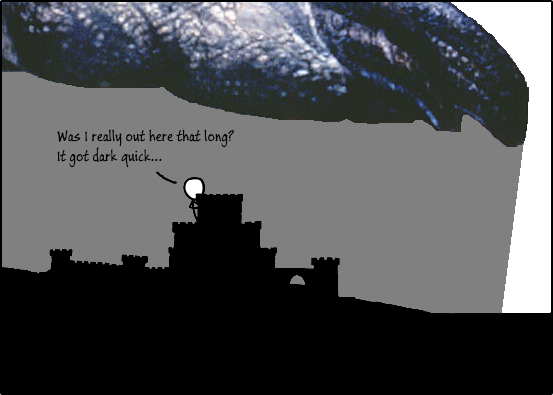 Wraithlord wrote: If part of the castle collapses as he is apparently climbing out of it, it would be too amusing for words. If someone were clever enough to figure out what the next hash would be by examining the hashes from the previous images, there is a possibility of being able to reveal the rest of the images, however, I personally hope it remains a mystery. KroniK907 wrote: If someone were clever enough to figure out what the next hash would be by examining the hashes from the previous images, there is a possibility of being able to reveal the rest of the images, however, I personally hope it remains a mystery. There is no reason to believe that there is a pattern. The "hashes" are 64 character strings of hex digits. Either they are hashes of some plaintext which could be identified and used to predict future image names or they are just randomly generated 64 character strings of hex digits. The latter seams much more likely to me. On could, in theory, try all 115.8 quattuorvigintillion such strings and find all so named images on the xkcd server, but that will take more time than, well, there is. The hashes are probably NOT random, but if Randall decided to make it impossible for us to guess the sequence, it's very easy for him to do so. It could be the sha256 hash for correcthorsebatterystaple_1, then correcthorsebatterystaple_2, etc. Huh. Some say that he did it, but to me it seems like some one (Black Hat?) 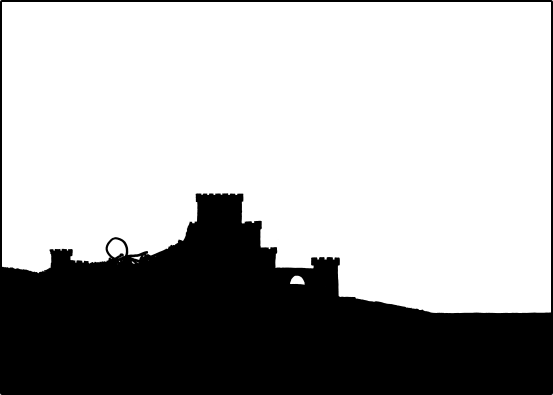 used a cannon or other propulsion device to launch him into the castle, breaking his bones and effectively immobilizing him, rendering him a useless pile. Then the girl will return to find him dead... or take him the the hospital, whatever. Or she'll just torture him to death for breaking the sandcastle. "You don't think people use the forum enough? Bet you a hundred I can change that..."
Seems like a legit reason for him doing this. Though all of the other deep thought stuff isn't half bad either, but in my experience not everything starts with deep thought as a reason for its existence. And I really hope this isn't something related to his relationship or cancer baby's or what not, unless the girl comes back and it has a happy ending. Then it can be about real life. echo "Current hash is: $CURRENT"
Who knows how long I'm going to have to keep this running for now, even after we think it has "ended"